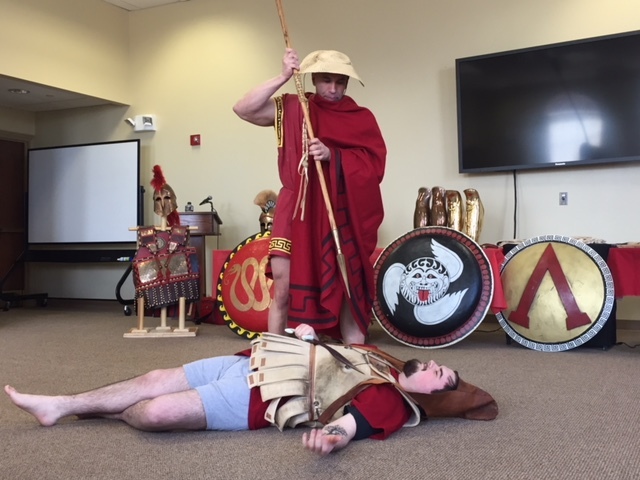 Gamal Castile, dressed in ancient Greek-style clothing points a spear at sophomore history major Kendall Gammon. Educating people about Greco-Roman wars is important to Castile, who stressed the significance of the wars. “One battle in 490 BC [the Battle of Marathon] could arguably be responsible for the entirety of what we consider western civilization,” said Castile, noting that, had the greeks lost the battle, our collective history could have been fundamentally altered. Another point Castile stressed was the ferocity of ancient Greco-Roman war tactics. “Greek culture was based on challenge and struggle – on bravery,” said Castile. It was this bravery that Castile demonstrated through an orchestrated war reenactment, using volunteers from the crowd. Various attendees dressed in battle armor and weilding shields and faux spears form a battle line across Gano Assembly. 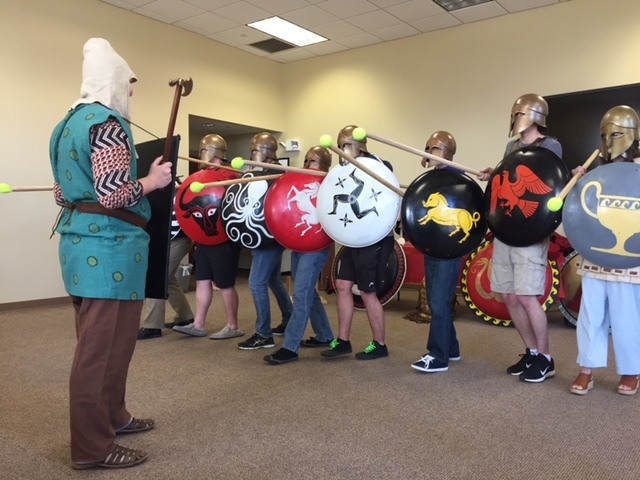 Overall, this event was well attended, and those present utilized Castile’s knowledge of Greek history to learn more about various war tactics and how they affected the culture of the ancient Greeks.